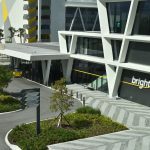 Brightline: Railroad of the Future? When I was growing up, Dippin’ Dots ice cream sold with the slogan, “Ice Cream of the Future”. In fact, I looked and today in 2018 they are still the Ice Cream of the Future. I guess the future had not arrived on-time. 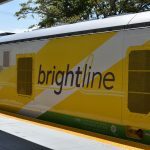 However, the future was my take away after my first visit to ride on Brightline in Southern Florida. 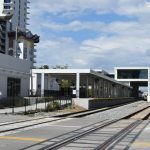 A few weeks ago we arrived in Ft. Lauderdale with time to kill, and I decided to see if the nation’s newest intercity train system was worth the hype. 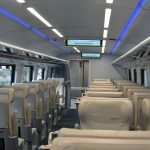 Formerly going off the working name “All Aboard Florida”, Brightline opened their first segment in early January. The full service is planned to run from downtown Miami to Orlando. Most of the service is on the Florida East Coast Railway, with about 40 miles of new right of way being built to connect to Orlando. At this present time, they are operating a “demonstration” service between Fort Lauderdale and West Palm Beach. Service to downtown Miami is expected to begin sometime in the next few weeks. We arrived at the Ft. Lauderdale station on a typical day in South Florida, with bright sun and highs in the 80s. With only limited time available, we had taken a rideshare from the airport rather than mess with Tri-Rail. The driver did not know where the station was as you can expect with new service, but we made it with no issue. The first thing you will notice arriving at the station is just how much development was happening nearby. 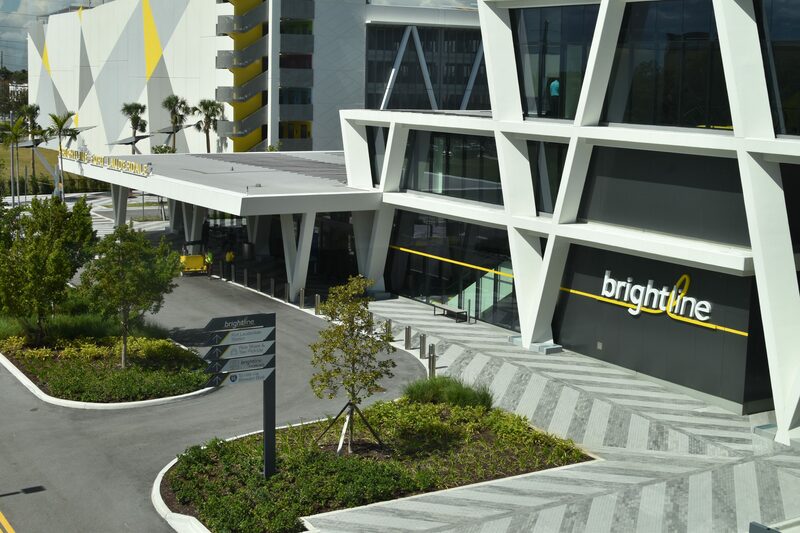 One of the unique advantages in their business model was the extensive downtown real estate owned by Fortress Investment Group, Brightline’s parent company. Most people believe their goal is to break-even or make a small surplus on rail operations, with the majority of their profit being driven from increased land-value and property development. In a way, it is a throw-back to Henry Flagler’s original development strategy for South Florida. Walking into the stations themselves, you are first struck by the newness of it all. 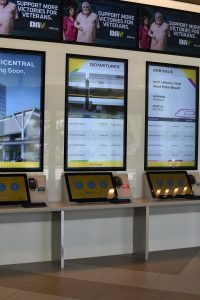 Tickets are purchased on touch-screen kiosks. The process is simple, though entering passenger information can get a bit lengthy. I was able to avail myself of a 10% NARP discount and special fares during the introductory period. The downstairs level includes a staffed desk for baggage check-in. We proceeded up the escalator where I received my first negative surprise of the outing, a security checkpoint. We were required to put all bags into a scanner and proceed through waist-high metal detectors. The line was short and the guards were friendly, although it was clear they were inexperience as they had to send my bag through the scanner multiple times. We also scanned our tickets going through security, similar to transit system with platform control. There were no ticket lifts done on the train. Departures are frequent throughout the day, though there are a couple gaps around midday that near 2 hours. We arrived during one of these gaps, and I made it a point to purchase “Select” class to gain access to the lounge. 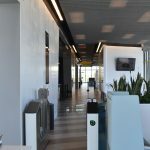 The lounge area was located at the end of the main waiting area. Access was controlled via ticket scanner. An alarm would ring if you tried to “tail-gate” someone into the lounge (ask me how I know). The lounge was comfortable, with plenty of outlets and snacks. 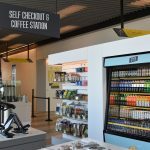 Sadly, Pepsi continues its monopoly on the US Rail market as the soda of choice for Brightline. At boarding time, we headed back down to the platform. 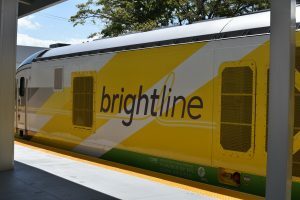 For equipment Brightline uses Siemens Charger locomotives and semi-permanently coupled passenger cars that are similar to what the Midwest State recently ordered to replace the stillborn bi-levels. Seats were assigned automatically at the point of purchase. Those that have a profile setup through Brightline’s website can input preferences like specific areas of the coach. 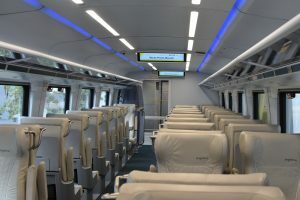 This could be important as each coach is setup with half the seats facing each direction, and no effort is made to turn the train at the endpoints. 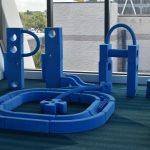 I’m not sure if this is a choice solely for the startup period, but given that the trainsets are setup for “pull-pull” operation I think it is likely to continue. The service was good. An attendant assigned to “Select” did a quick drink service. Everything is done from carts, though I have heard cafe cars may be delivered after the expansion to Orlando. Passenger loads were light as one would expect on a mid-day train during the intro period. I did a few businessmen which surprised me, and a few other joy riders checking the service. This part of the route was very straight, and we quickly reached the max speed of 79 mph. Freight traffic was limited so the dispatching was superb. I only saw one other train during our round-trip. There was a shocking amount of grade crossings, perhaps more than I have ever experience on such a short route. I’m not surprised that issues with trespassers and grade crossing collisions have been in the news. 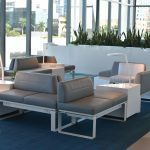 Overall, I think Brightline is doing a lot of things right. 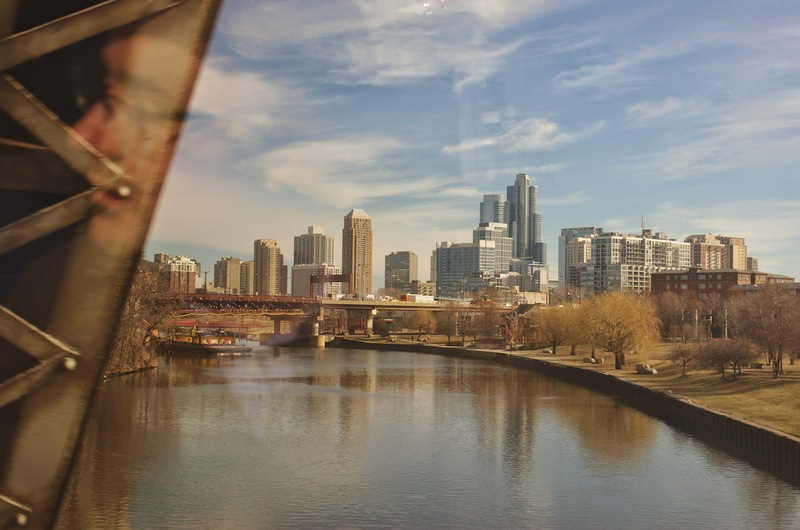 There are plenty of things that Amtrak could learn from and there are plenty of things they are doing that would not work with Amtrak’s system. My biggest concern is that those differences will cause Amtrak’s management to ignore the whole thing. I definitely got the feeling during my trip that I was experiencing the future of passenger rail outside of the Northeast Corridor. 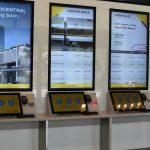 If the business model could somehow be replicated elsewhere, it could truly usher in a golden age of corridor service in places where there is currently none. AMTK 154 at track speed just South of Camden, OH. When one lives in Ohio, any Amtrak train viewable during the day time is a cause for celebration. When the train features a heritage unit and 20 cars of Private Varnish, it’s not even comparable. 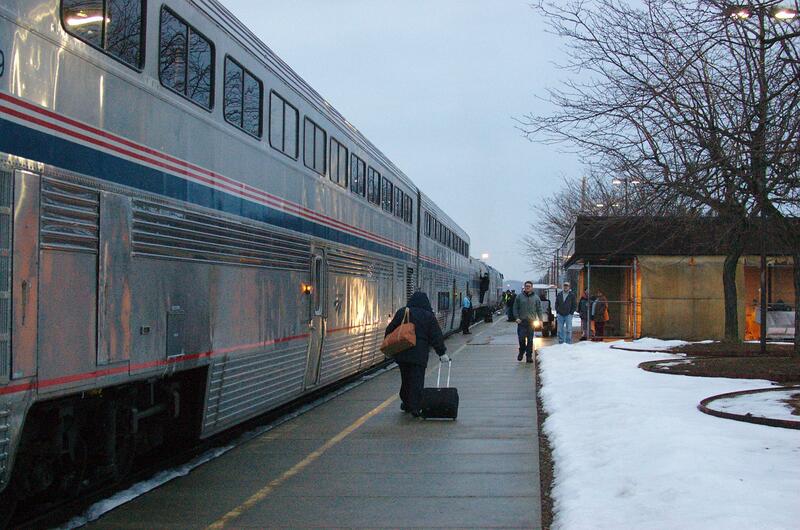 On Sunday, the American Association of Private Railcar Owners left Chicago for their 38th Annual Convention. 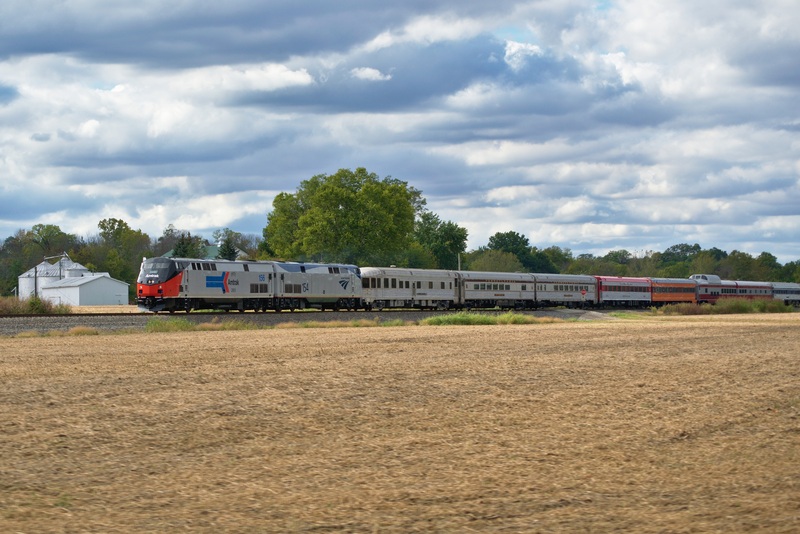 Known as the “Spirit of St. Louis, the special charter is travelling on a circuitous routing to St. Louis, stopping for tours in both Cincinnati and Louisville, Kentucky. I have never been out west. Sure, I had journeyed across the Mississippi into suburban Missouri, but I had never seen the great vistas and the famous parks that my country is known for. I had never truly “gone West”. For years I had been telling myself that I needed to do this. But with news that the ex-Santa Fe route of the Southwest Chief may be in jeopardy, I no longer had any excuses. So thus I found myself standing in the wee hours of the morning on the platform at Union Terminal, preparing to board the westbound Cardinal and my Chicago-connection to the Southwest Chief. 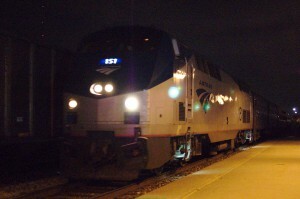 This would be a trip of many firsts for me, and it began with my first experience in Amtrak’s sleeper class. I had booked a roomette as part of my 2-zone Guest Rewards redemption. With Cincinnati on the zone-border, that meant I could get to experience the Cardinal’s one single-level sleeper. Additionally, I could bring a friend in my roomette for the same amount of points. That was how it all began. Several hours and one visit to Amtrak.com later, I was on my way to Cincinnati Union Terminal and seriously questioning my sanity. Sometimes a railroad history comes along that isn’t just a history. It’s not a lecture of facts, figures, and dates. But instead is a story of people, of power, and the great men that shaped the country. 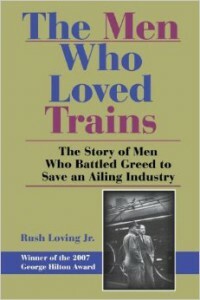 In The Men Who Loved Trains Rush Loving Jr. takes the reader through the most tirmulous time in the history of the rail industry. Beginning with the merger-mania of the early 1960’s and ending with the Conrail split, quite a lot of railroad history is condensed into 345 pages. 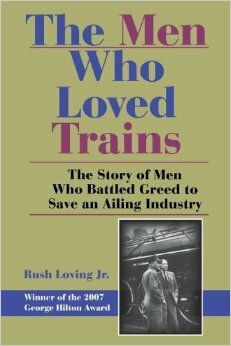 A more modern work, Loving provides additional perspective not seen in some of the earlier histories such as The Wreck of the Penn Central. He managed to research during that critical time when many of the players were still around but had the ability to be more honest and open about their decisions. My other major complaint is the amount of Enron comparisons. It’s a salient point to make, but after two or three times the horse had been beat to death. This will only get worse over time, as it dates the work solidly into the second term of the George H.W. Bush administration. In today’s post-bailout world, the Penn Central comparisons could be taken even farther. I don’t consider myself prone to hyperbole, but I consider this one of the most informative and useful railroad histories of the last 20 years.This book should be the cornerstone of any serious rail literature collection. If you’re interested in The Men Who Loved Trains , you can support Rare Mileage and purchase it from Amazon . It’s available for Kindle and in paperback . The word ‘Winter’ brings to mind many things. The cold of January, snowfall, ice, and darkness all combine to create a less than hospitable environment. With bleak landscapes and the January’s ever-present gray overcast sky, the winds of winter do not create the ideal scenario for excursions trains. Yet that did not stop myself and two of my co-workers from visiting the Cuyahoga Valley Scenic Railway. CVSR is one of few tourist trains that runs throughout the winter. Their 2015 Season began not long after their Christmas rides ended with the new season beginning January 18th. Through February 28th, they run two round-trips every Saturday. This is down from the Saturday and Sunday winter schedule of a couple years back, but is still one of the most comprehensive winter tourist schedules that I’m personally aware of. 2014 became a special year for me in November. Not because I’m yet another year older, not because it was another great year, but because 2014 is the first time I have ever taken 2 Amtrak trips in the same year. Will and I decided on a spur-of-the-moment trip to take the second-annual Amtrak Autumn Express out of Philadelphia. And what better way to get there than on our home train, the Cardinal. Quick, what was the first transcontinental railroad? If you guessed the Union and Central Pacific’s combined route across the United States then I’m sorry, but technically you’re not correct. 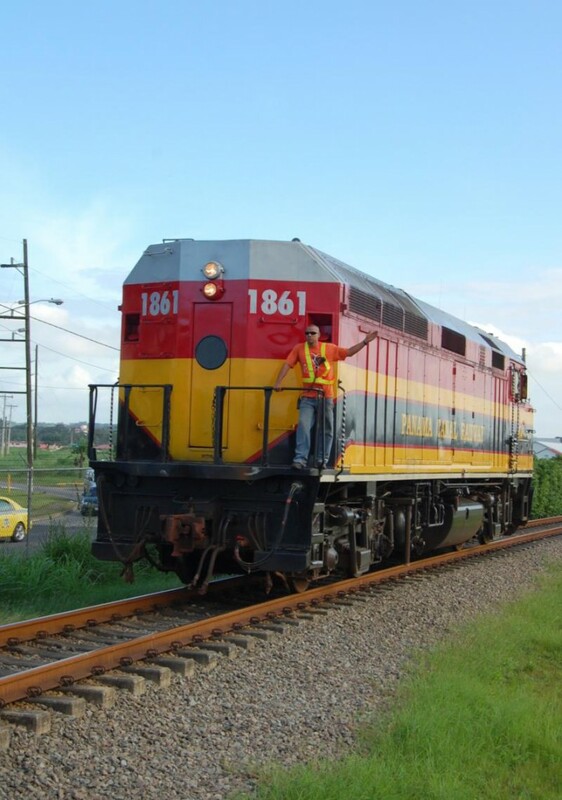 The original Panama Railway completed the first route connecting the Atlantic and Pacific oceans in 1855. I recently had an opportunity to ride the Panama Railway’s modern successor, the Panama Canal Railroad Company. Our first photo of the week for 2011 comes on a little bit of a sad note. The above is a shot of the Oakley depot, on the old B&O in Cincinnati. The station was originally built in 1903 as part of the Marietta and Cincinnati Railroad. It was an important stop for workers commuting to industries in Oakley, like Cincinnati Milacron. 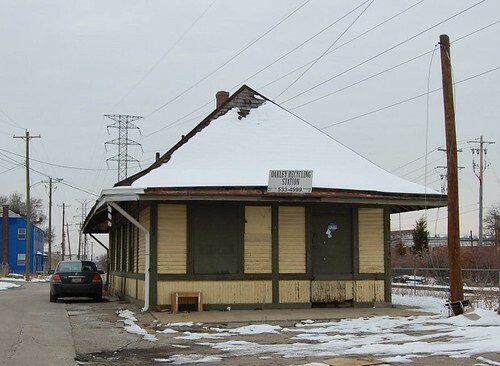 While not a technically impressive photo, I wanted to bring attention to the fact that this historic depot is currently scheduled to be demolished. The owner, Doug Master, purchased the station in 1991 but can no longer afford the lease payments for the land it sits on. The payments to CSX are now $1,300 per quarter. Currently there are no solid plans to save the station, although there has been some discussion about moving the station to land with more favorable arrangements. If anything solid develops we will post about it here. Update: The Oakley Depot was demolished on July 11, 2013. It’s been a while since I have done a book review. Luckily, I managed to pick up a copy of Edward H. Miller’s The Hocking Valley Railway . Published relatively recently (crica-2007), the book provides a detailed and nearly comprehensive look at Ohio’s largest intrastate railroad. The Hocking Valley Railway began its corporate history as the Mineral Railroad Company in 1864. 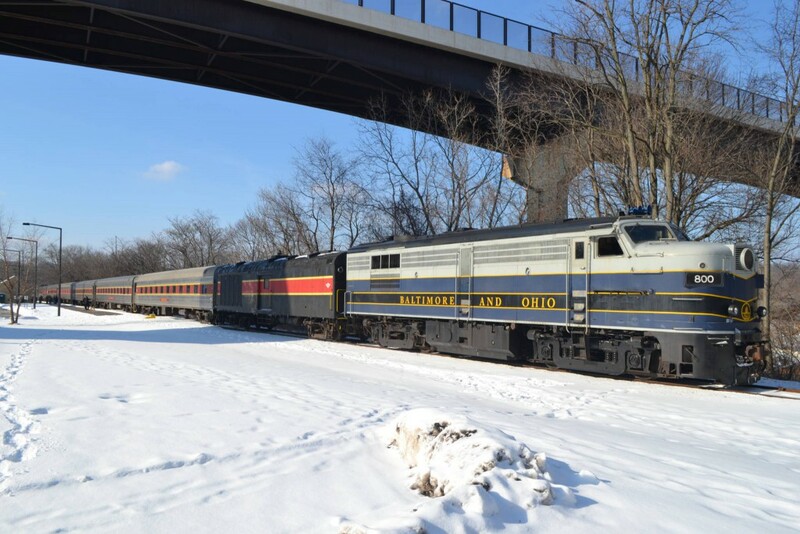 Chartered to carry coal from the Hocking River Valley to the markets of Columbus, the railroad soon underwent a name change and became the Columbus and Hocking Valley Railroad. After a number of mergers, buyouts, and receiverships, the railroad became the Hocking Valley Railway in 1899. It is under this name the railroad was most well known. The Hocking Valley became a fallen flag after being purchased by the C&O in 1930. Miller goes through detailed histories of each predecessor railroad, its lines, and its relationship to the Hocking Valley. He also includes short biographies of each railway president, something I have not seen too often in these kind of works. In-between the larger themes of the narrative (ownership, presidents, and corporate games), he finds time to work in significant but smaller events from the time period discussed like wrecks, expansions, and the occasional disaster.